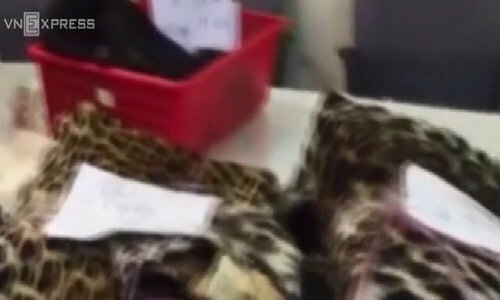 Leopard skins were found inside the detained woman's luggage. Photo by H.Q. The illegal haul was cleverly hidden in her luggage and worth an estimated VND2 billion ($88,000). 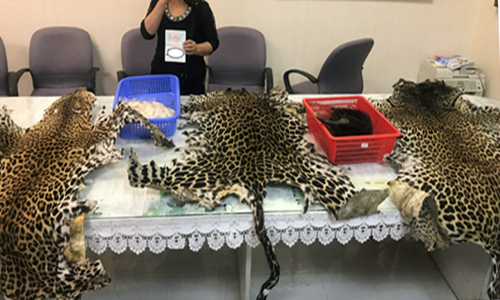 A 65-year-old Vietnamese woman was detained at Tan Son Nhat International Airpoirt on Sunday for trying to smuggle leopard skins, ivory and other elephant parts into the country. The woman touched down on a flight from Africa but was stopped by customs authorities after they spotted her acting suspiciously. During a luggage inspection, they discovered three sets of leopard skin as well as elephant parts, including 4 kilograms (24lbs) of ivory, nails and nine tails. The illegal haul was cleverly hidden and worth an estimated VND2 billion ($88,000), a customs official said. This is just the latest in a string of cases involving prohibited wildlife products to be busted by the Customs Department at Tan Son Nhat over the past month, with items including rhino horn, ivory and pangolins worth over VND10 billion stopped and seized. On May 4, customs officials in Ho Chi Minh City detained a Vietnamese woman after finding ivory and pangolin scales worth nearly VND300 million in her luggage. Last month, customs officials at Tan Son Nhat and anti-smuggling police also seized 5 kilos of rhino horn from two Vietnamese passengers returning from Africa. Vietnam is considered a hotspot for the illegal trade of wildlife products, which are used for medicine and decorations and often considered a status symbol. It is illegal to hunt, kill, trade or transport wild animals in Vietnam, but the high returns continue to lure many people into trafficking networks.